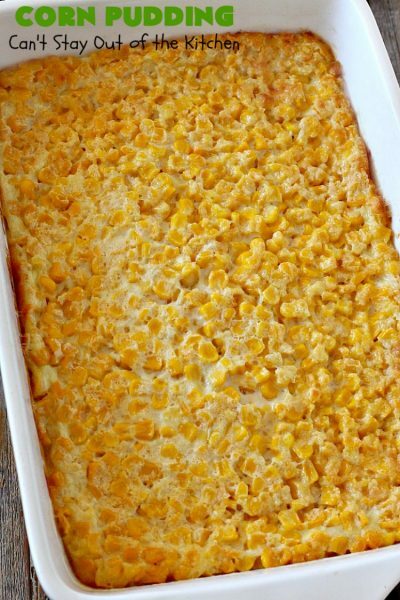 Corn Pudding is a fabulous corn casserole–certainly one of our favorites. 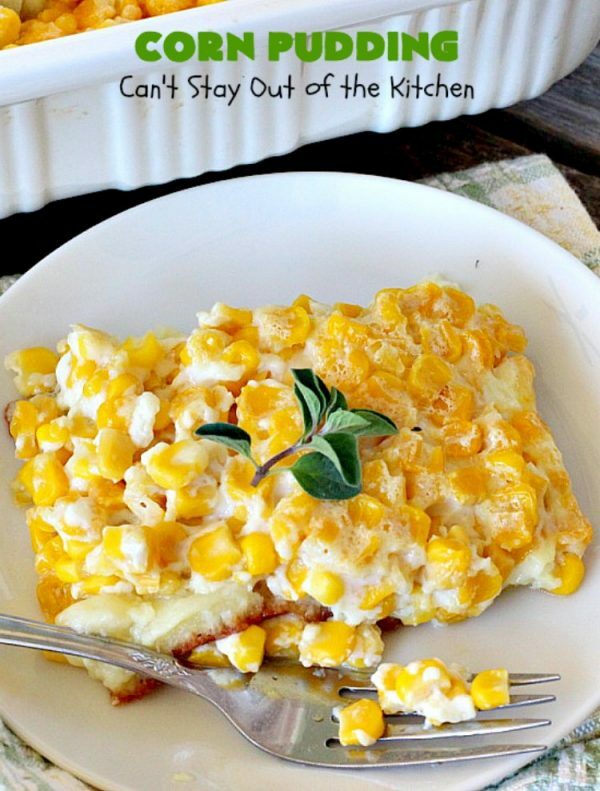 It’s like a corn souffle with lots of delicious corn in every bite. It’s so quick and easy, too. It only takes about 5 minutes to throw this together. Our family loves this tasty Corn Pudding recipe and I’ve served it often over the years. It is one of the BEST recipes I have collected since I started cooking. It is so easy. You can make it using up fresh corn, frozen corn, or the usual canned corn. It has a souffle-type texture that is superb and light without sacrificing flavor. I also always have these ingredients on hand so I can whip together this casserole in about three minutes and have it ready to go! This is the first corn casserole recipe I ever received. Kay Stafford used to help cook at the men’s Bible Study luncheon at First Baptist Church in Indian Rocks when I worked there in the early 80s. I remember Kay as a godly servant who stayed behind the scenes, never drew attention to herself, and used her gifts and talents to serve others. She was a wonderful down-home style cook. She made this several times and I finally asked her for the recipe. I think of Kay every time I make this recipe–and it’s been hundreds of times over the years. 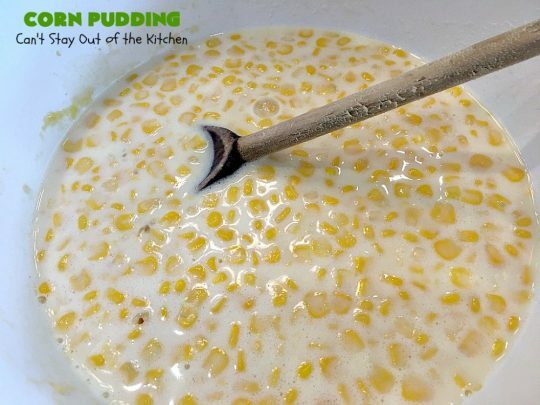 If you want the quickest, easiest, most economical corn recipe you can find, this corn pudding recipe is probably it! 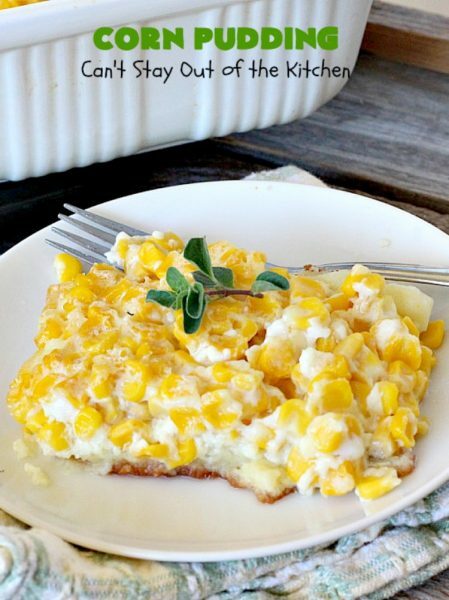 We love this amazing corn recipe and I think your family will too. A lot of our company over the years have partaken of Kay’s corn pudding recipe. Kay apparently got the recipe from The Joy of Cooking. 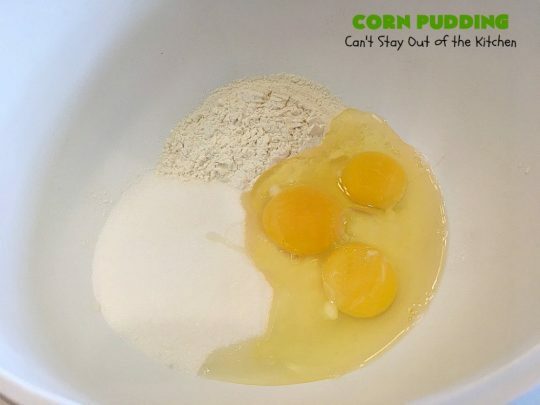 I’ve only made a couple of slight modifications over the years and that was to change the corn amount from 2 cups to 2 cans–it’s slightly more so I just dumped all of the corn in, and to increase the flour slightly. When I make it with freezer corn I use a full 16-oz. bag. When I serve it, I usually cut it into squares, but you can also serve it with a spoon. I’ve made this recipe several times since I initially posted it about ten days after I began this food blog. I’ve upgraded the pictures once, and now I’m upgrading them again with a better camera so you can have a good idea of what this lovely casserole is supposed to look like. Now I’ve remade the pictures a third time (December 2017) and updated the pictures again. There is one caveat however. The casserole is supposed to be baked, uncovered, for an hour. That way the corn cooks properly and sets firmly. When I served it yesterday for company, I had many people exclaim how good the dish was. It is still one of our favorite side dishes! 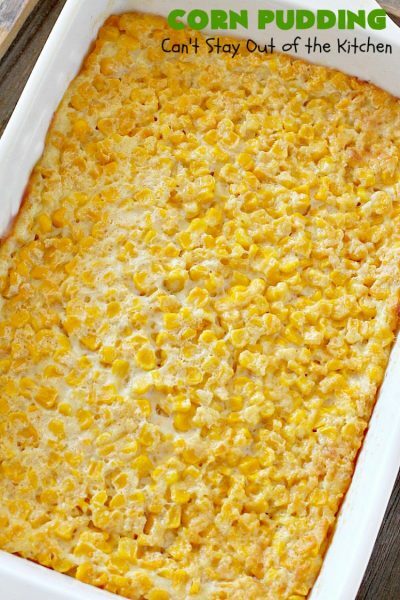 Corn Pudding is one of our favorite holiday side dishes. 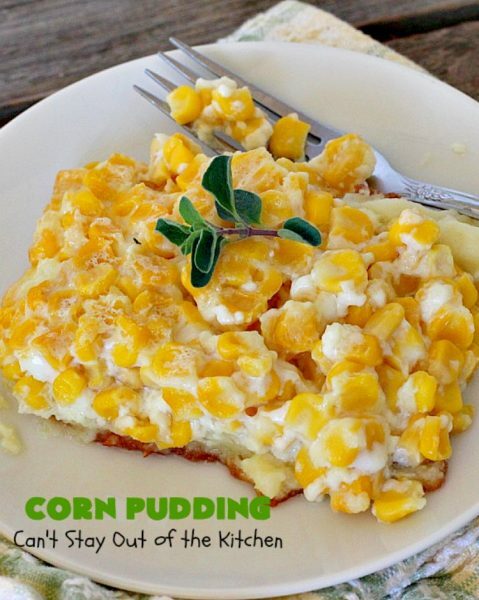 Corn Pudding is so quick and easy. I can usually have this oven ready in about 5 minutes if I microwave the butter rather than melt it in the oven! 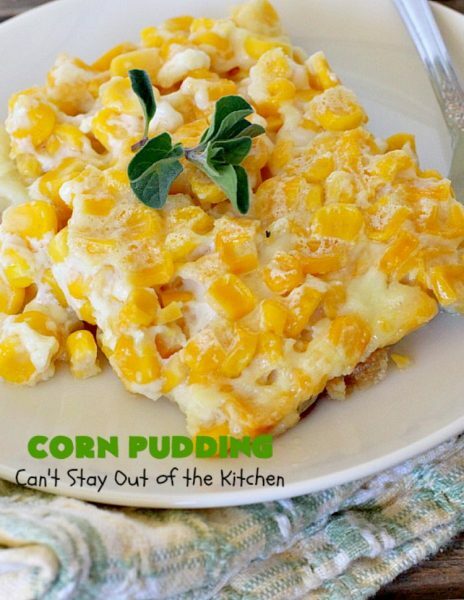 Everyone always raves over this tasty corn dish. I’ve used fresh, frozen and canned corn in the recipe. I used these ingredients to make Corn Pudding. Place eggs in a bowl. Add sugar, flour and salt. Drain corn. Add it along with the milk to other ingredients. Place a half stick of butter in a 9×13″ glass baking dish and melt in the oven. If you really need to save time, melt the butter in the microwave and pour into a 9×13″ glass baking dish. 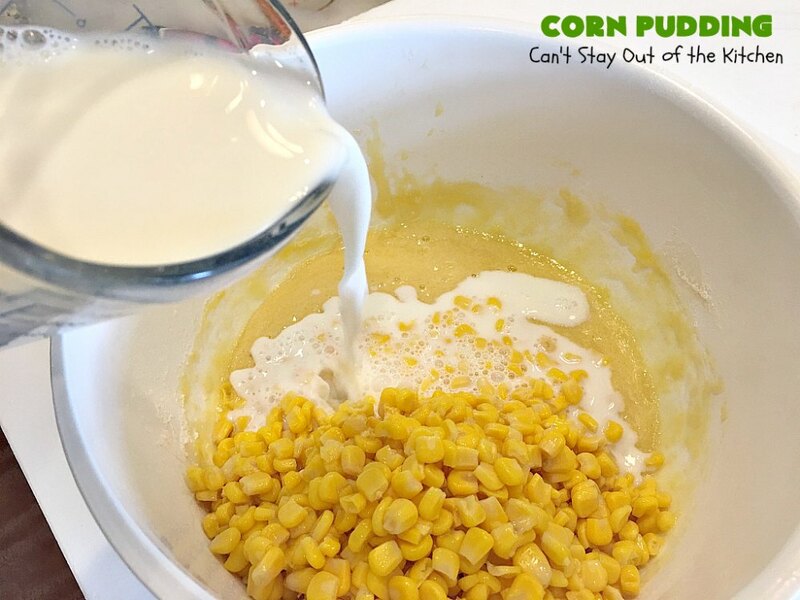 Pour corn mixture into pan with melted butter. 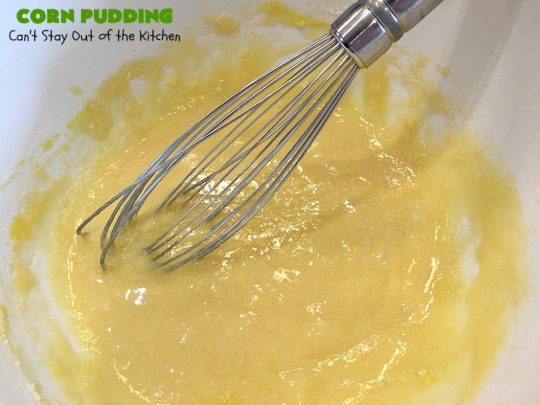 Make sure you scrape all the sugar out of your mixing bowl and stir the ingredients around a little bit in the casserole dish so all the sugar doesn’t end up in one spot. Put it into the oven and bake uncovered for 60 minutes at 350. I’ve had it cook in as little as 45 minutes (when nothing else is in the oven) or, need as long as an hour and 10 minutes if there are other casseroles in the oven. It will get a nice golden brown when it’s finished and it will be completely set in the middle when it’s done. I usually cut this 3×4 making 12 pieces and serve it out with a spatula. Corn Pudding is great for holiday entertaining or company. The texture is souffle-like. 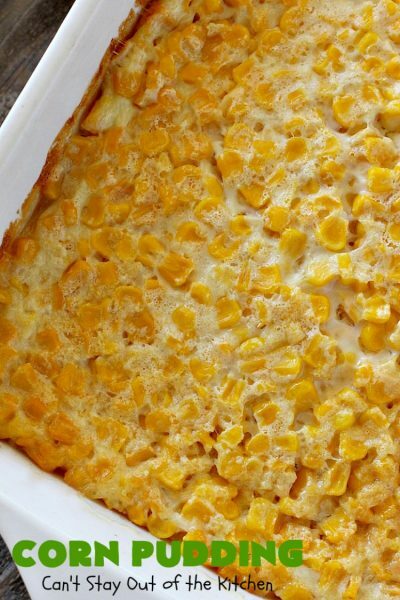 Spectacular corn casserole recipe with a souffle-type texture. Quick, easy and great for holiday entertaining. Melt butter in 9x13” baking dish in 350° oven. Combine eggs, flour and sugar; beat well. Add milk, corn and salt. Stir corn mixture to combine and add to melted butter in baking dish. NOTE: When combining corn mixture with melted butter, make sure you stir ingredients well so the sugar doesn't end up all in one spot of the casserole. NOTE: To save time, you can also melt the butter in a microwave and spread over the bottom of a 9x13" glass casserole dish. Melt butter in 9×13” baking dish in 350° oven. 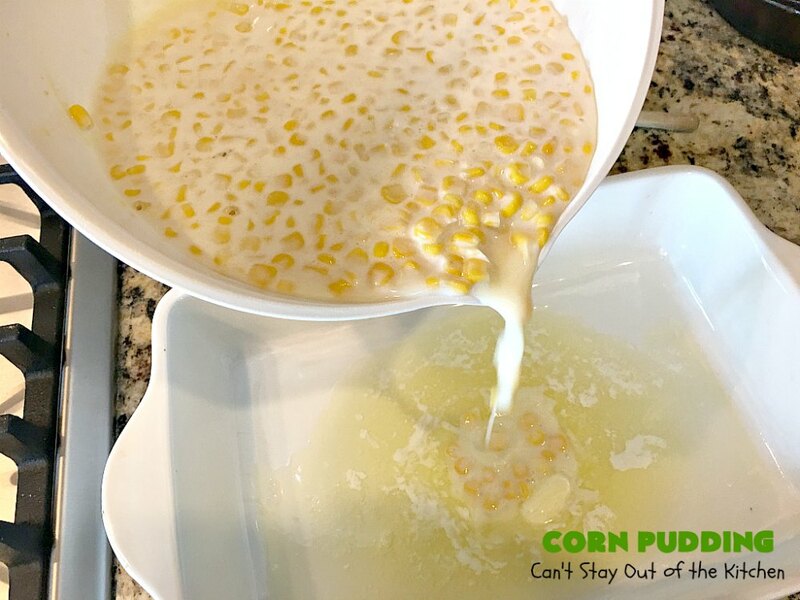 When combining corn mixture with melted butter, make sure you stir ingredients well so the sugar doesn’t end up all in one spot of the casserole. [br][br]To save time, you can also melt the butter in a microwave and spread over the bottom of a 9×13″ glass casserole dish. Every time I serve Corn Pudding I get rave reviews. This was one of the first recipes I ever collected, and one I’ve made hundreds of times throughout the years. 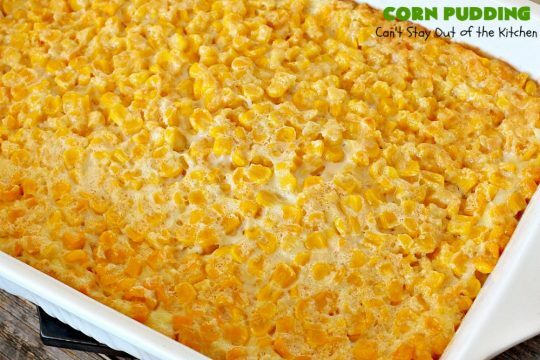 Doesn’t Corn Pudding look marvelous? It’s quick and easy and so inexpensive, making it a win-win for me! When you say 2 large cans of corn, what size are you using in ounces please? You can find this recipe pretty much as written in the 1974/76 edition of Joy of Cooking.. A large can of corn holds 2-1/2 cups. Thanks for the tip, Yves. When Kay gave me the original recipe she never said where she got it. All I can say is it’s a winner! 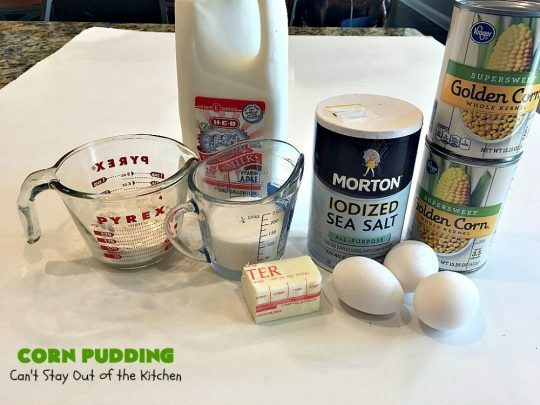 The recipe for the corn pudding says 1/2 stick butter but the caption under the picture of the butter says one stick of butter?? Did you double the recipe for the picture or is it supposed to be one whole stick of butter? ?